Yep, this HOT offer definitely requires a happy dance! If you prefer leaner options for breakfast, here’s a super offer to check out. Score FREE Butterball Turkey Bacon at Safeway after the sale price and a coupon. You’ll save 100%, woohoo! The sale is valid September 27th – October 3rd. 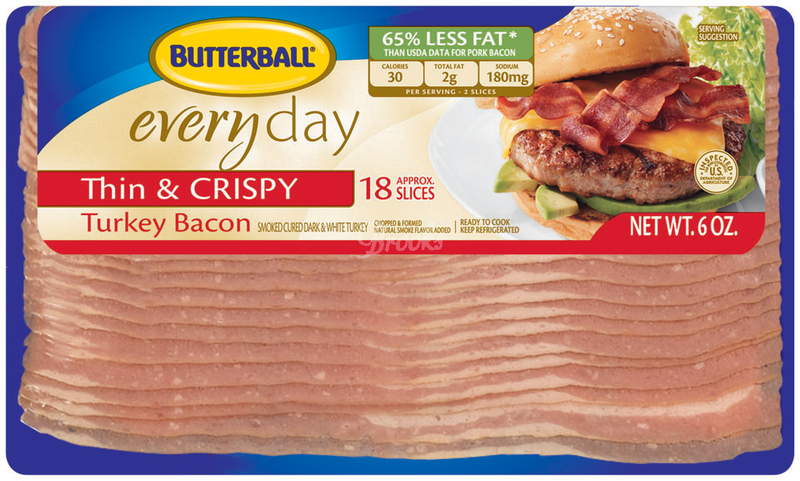 Pick up one (1) package of Butterball Thin & Crispy Turkey Bacon 6 oz. on sale for $1.00, valid 9/27 – 10/3. Print and use $0.55/1 Butterball Turkey Bacon. Or submit the $3.00 cash back when you buy $12.00 select Butterball products SavingStar rebate. Final price = FREE after the printable coupon, save 100%! Thanks for reply. I rechecked coupon I printed and it DOES have the 12 oz restriction. Since the coupon in question is printed through coupons.com (even though you start on the Butterball site) I have two choices of how to print — as I have two registered devices (computers) that can access coupons.com. I then printed a second copy using my 2nd registered computer and got a coupon with NO restriction. My 2nd computer is at an address in a different zip code so maybe there is some kind of regional thing going on here? Interesting. It’s entirely possible! Thank you for letting us know this could happen! The Butterball Turkey Bacon coupon you cite above printed out for me from the Butterball site with a restriction on it that it can only be used on packages of 12 oz or greater. So it will NOT work for the 6 oz Bacon package. I have noticed that all of the recent Butterball Turkey Bacon coupons I have seen contain this restriction. Much earlier this year this type of coupon had no restriction on size of package. But all the recent Butterball Turkey Bacon coupons seem to contain the restriction. Hi Arthur. Thank you for your note. The coupon did not have that restriction for me from the Butterball site. We printed and confirmed twice from 2 computers today before posting this coupon link. Please double check your printed coupon. The image on the Butterball site is of a 12 oz package, but the coupon itself has no size restriction. HOORAY!